Max, deadpan and looking "Terminator-like", walking towards the camera with a beer. Me looking at the lens with "important" things to say. Bain over my shoulder eating donut holes with sprinkles. Peter, thats fantastic. So what if Pacers is faster. We are cultured, funny and way better looking, too boot! FYI--I ended up pulling an all nighter after twighlighter. As is usual custom, I found numerous runners from out of the woodworks to talk to until the weeeeeee hrs of the morning. Got home wicked wicked late and was so buzzed from the run, just stayed up and cleaned the house. Soon it was 8am and I departed to BWI and headed off to Vermont. I am now in runner's heaven in the middle of nowhere enjoying some quiet time. 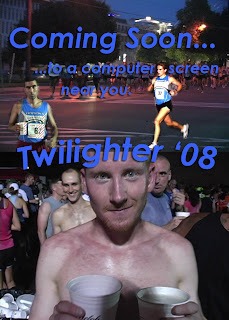 Sorry running fans, don't stay up late because the video won't be up until tomorrow. Post-Production has wrapped and I am just letting it render now. I will upload it tomorrow.